Every single recipe I have made from this book has been outstanding. Each one is full of flavour and so good for you! 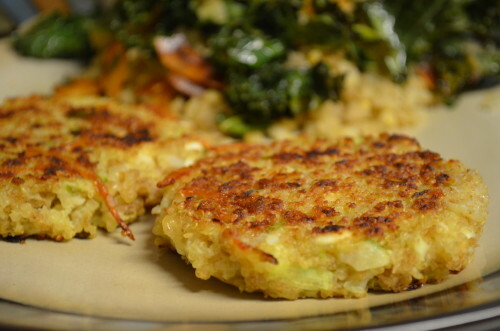 These patties can be used as either a snack, or main meal if paired with a salad. I paired it with Heidi’s Kale Salad. * To cook quinoa: Combine 2 cups of well-rinsed uncooked quinoa with 3 cups water and 1/2 teaspoon fine-grain sea salt in a medium saucepan. Bring to a boil, cover, decrease the heat, and simmer for 25 to 30 minutes, until the quinoa is tender and you can see the little quinoa curlicues. Combine the quinoa, eggs, and salt in a medium bowl. Stir in the chives, onion, cheese (+ Feta if using), and garlic. Add the bread crumbs, stir, and let sit for a few minutes so the crumbs can absorb some of the moisture. At this point, you should have a mixture you can easily form into twelve 1-inch thick patties. I err on the very moist side because it makes for a not-overly-dry patty, but you can add more bread crumbs, a bit at a time, to firm up the mixture, if need be. Conversely, a bit more beaten egg or water can be used to moisten the mixture. Heat the oil in a large, heavy skillet over medium-low heat, add 6 patties, if they’ll fit with some room between each, cover, and cook for 7 to 10 minutes, until the bottoms are deeply browned. Turn up the heat if there is no browning after 10 minutes and continue to cook until the patties are browned. Carefully flip the patties with a spatula and cook the second sides for 7 minutes, or until golden. Remove from the skillet and cool on a wire rack while you cook the remaining patties. Alternatively, the quinoa mixture keeps nicely in the refrigerator for a few days; you can cook patties to order, if you prefer.